Friday night on The CW, the latest episode of The Originals aired. Remember, next Friday is the finale. So The Hollow is in Hope (Hayley and Klaus' daughter). Hayley tries to brush Hope's hair and notices that Hope is acting weird. Marcel injects Sofia and explains, when she comes to, that she has been in coma since The Hollow entered her. She says The Hollow isn't dead, she can still feel it. Vincent is charged by The Hollow's underlings who steal the book on The Hollow. Let's move to something nice. Freya goes to see Keelen. She explains that when she was battling The Hollow, she saw her greatest fear: Keelen dying and Freya having no way to stop it. After, this exchange . . .
Keelen: You coming to see me this morning, it was nice. Freya: Truth is, I almost ran. Pretty good at that actually. Freya: Well, it just hit me that when I die, I'm not going to wake up five minutes later. Neither are you. Compared to the rest of my family, my life is going to be so short and I guess I just didn't want to waste it anymore. Even if Hayley hadn't decided it was over with Eli, Freya and Keelen would be my favorite couple. Rebecca spoke with Hayley who told her that she didn't want Hope raised to believe it was normal that you destroy whole cities to wipe out your enemies, etc. Hayley was avoiding Eli but he sensed what was going on and talked with Klaus. It's always kind of weird that Hayley and Klaus had the baby but it was Klaus' brother Eli that Hayley loved. Vincent harnessed the power of Marcel (with Marcel's reluctant agreement) to go back and time to the creation of The Hollow and he heard its birth but was thrown back out. Marcel's power wasn't strong enough. Vincent needs the book that was stolen or . . .
"That leaves us with one option, I have to be dead." So he goes dead while Eli and Klaus go after the underlings. Rebecca talks to The Hollow who she thinks is her niece Hope. The Hollow has tossed out a friendship bracelet into the fire and Rebecca thinks Hope is scared. "In a thousand years, nothing has bested us. We can't be defeated," Rebecca assures her. "Well there is one thing," The Hollow says. And The Hollow makes a piece of wood pierce Rebecca from the back and down she goes. Meanwhile a happy Freya enters the compound and goes up to Hayley, "I know we're not always the most honest around here but I had to tell someone . . ."
She looks at Hayley and stops because Hayley is so depressed. Hayley explains Hope is acting weird and hands Freya the brush she was trying to brush Hope's hair with, "I took this from Hope's room, do a reading on this tell me what kind of energy you feel." Freya casts a spell . . . It's The Hollow. Klaus and Eli are about to tear into the underlings when one tells them that The Hollow is in Hope. Klaus goes into vampire mode and tears into it the man. Freya explains to Keelen what's going on and Keelen insists that she's going to go along. Keelen: "Don't try to stop me." Freya's cast a spell on Keelen to keep her there and safe. As she walks out, Hayley is watching Hope and proposing they go do something fun but Hope won't even look at her. And as The Hollow makes remarks, Hayley's tired of playing. She tells The Hollow, "I want my daughter back." Meanwhile, some underlings arrive at the graveyard to kill Vincent before he can go back to when The Hollow was created. Marcel's protecting Vincent and is supposed to bring him back to life with the same shot that pulled Sofia out of her coma. He tells them that they're not going to hurt Vincent unless they go through him "and in case you haven't heard I can't die." They don't care, they're up for the challenge. As they fight, Hayley and The Hollow exchange words. "I don't care how long it takes or what I have to do I will get my daughter back," Hayley tells her. The Hollow: You won't. Hope is still fighting but she'll give in soon. The Hollow flashes Hope's arm where the image of the serpent swallowing its own tail is about 1/4 visible. The Hollow: Once this is complete, I'll be in her body permanently. Then she adds, "You won't hurt me I'm your daughter." Freya appears from behind chanting a spell. It causes The Hollow to pass out. Hayley: How long do we have? Freya: Not long. We need to work fast. But as they do, The Hollow turns to mist above Hope's body and goes down to confront them. She tosses Freya across the room and then, when Hayley charges her, sends a knife type weapon through her. As Marcel, Vincent, Sofia, Eli and Klaus get ready to enter the compound, Sofia stops Klaus to explain about when The Hollow possessed her, "While she had me all I wanted to do was give up." She adds, "You can't let that happen to Hope." As a result, Klaus goes into spiritual mode and visits Hope to encourage her to fight. The others work on confronting The Hollow. Sofia sees lights flickering and then The Hollow appears before her. Klaus: Hope listen to me, you need to stay awake, you have to stay with me, can you do that? He tells her that he was brutal and evil before she was born but from the minute he saw her he wanted to be a worthy father and he needs her. Eli sees Hayley staked and vows vengeance. Eli: You will pay for this. The Hollow: I've killed you once Elijah I won't hesitate to do so again. She tosses Eli out of commission. Marcel enters telling her to show herself and asking, "What's the matter, the big bad Hollow too scared to face me?" She then ends Marcel (Marcel, like Klaus, Rebecca and Eli, is a vampire and can't die, Hayley's a wolf and she's not dead either). Vincent: That is vicious. Even for you. He must have struck a nerve. Vincent: Now I'm going to put you in your cave forever. He means the book. He's casting the spell. As this happens, Klaus is trying to keep Hope away. What do we all hate? I blabber. Someone who blathers on and on and doesn't do the job. He stops mid-spell to inform her that what she's feeling? That's losing and blah blah blah. She used that moment to break free. The Hollow: You think you've beaten me! Vincent is out, she's back in Hope. Back in Hope's body, The Hollow walks to the stairs, sees the book next to the circle that held her. She aims her hand at the book and sets it on fire. Last segment of the show. Rebecca, Klaus, Hayley, Freya, Keelen, Marcel, Sofia, Eli and Vincent are all at the compound. Vincent: I couldn't save her. She's The Hollow now. A cloud of sadness descends. Rebecca: There must be some other way. Vincent: I don't know any other way. Hayley's not accepting that result. She says she's going to save her daughter. Eli grabs her shoulder. Eli: I am on your side. Hayley: I should never have brought her back here. The Hollow meets with her underlings who bow before her. At the compound, Sofia comforts Vincent, while Rebecca turns her back on them. Vincent: I think I know a way to save her. All eyes turn to look at Vincent. Vincent: If we go this route, this is going to be the end of your family, this is going to be the end of always and forever. Friday, June 16, 2017. The Mosul Slog continues, a bishop misses the point, and much more. "That priest is probably still floating on a fog pillow," wrote Anne Sexton ("The Inventory Of Goodbye"). Bishop Bawai Soro's feet certainly aren't touching the ground. Reading his column at THE HILL, it's hard to figure out whether he's stupid or dishonest? ISIS is more in the news than the Iraqi government so he may be using them -- and lies -- to make a case. If so, it may attract more eyeballs for being 'trendy' but it will also attract many eyeballs from the heads of people who get that Soro doesn't know what the hell he's writing about. ICE and US President Donald Trump must not return Iraqi Christians to Iraq, he argues, because the will face the Islamic State. Forget the corporate spin that the Islamic State is on the run, the problem for Iraqi Christians throughout the Iraq War has not been the Islamic State. Yes, they've been victimized in the rare areas of Iraq that the Islamic State has grabbed control of in the last few years. But stop pretending that's it. The Iraqi government has failed them and has persecuted them. They have passed laws against them, the forces have raided their bars and establishments to shut them down even when the law wasn't on the Iraqi forces' side. The Islamic State is a recent thing in the long war. It will likely be replaced by something else. The same can't be said of the Iraqi government where thug Nouri al-Maliki was replaced by thug-lite Hayder al-Abadi. The exodus of Iraqi Christians from Iraq begins long before the emergence of the Islamic State (as did the relocating to northern Iraq from Baghdad). Is the Bishop a liar or just stupid? And the argument to make, pay attention here, against deporting the group back to Iraq is that the Iraqi government has not only failed to protect them, the Iraqi government has taken part in attacking them. The Iraqi government's history since the 2003 US-led invasion is one of persecuting religious minorities -- this includes Christians. So why would you force Christians to return to that country? That's the argument you make. You rest it instead on the Islamic State? The minute The Mosul Slog finally wraps up, people shrug and say, "Well they're over, no reason the Christians can't be sent back now." The Bishop had a column to make a case and he didn't. Instead, he's put out the highly damaging notion that, were it not for the Islamic State, Iraq would be a fine place for Iraqi Christians to live. But the Islamic State did not run them off from Baghdad. It wasn't the Islamic State, either, that reduced Baghdad's Jewish population to one elderly person. Day 240 of The Mosul Slog. 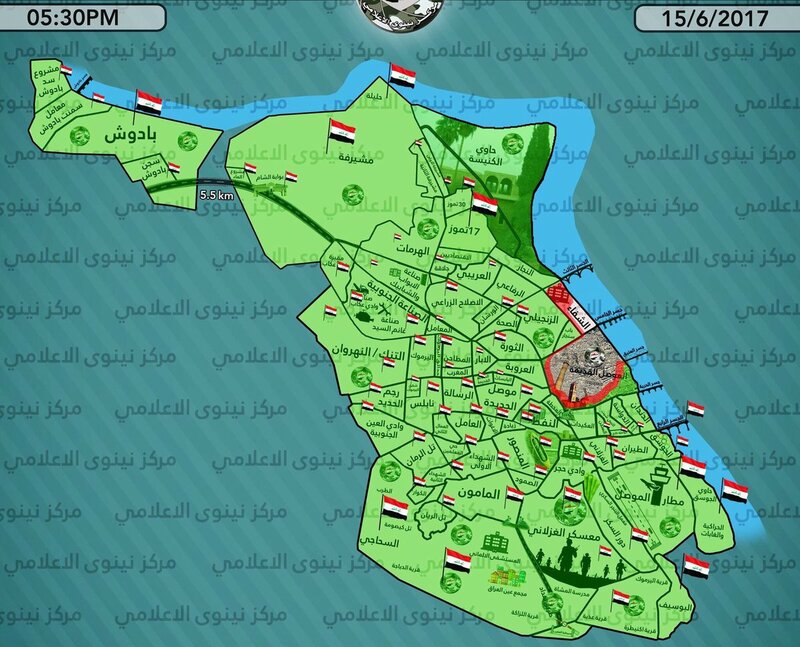 #Mosul #Iraq map update. Green= completely liberated. Orange= frontline clashes. White= #ISIS control. Good, because it's already been 240 days. by ISIS in June 2014. Nouri al-Maliki was prime minister then. Some have not forgotten that fact. Demonstrators called for Maliki to face justice as they marked the third anniversary of the Speicher massacre where Islamic State (IS) militants killed hundreds of students at the Air Force base near Tikrit. Banners listed the three “plagues” demonstrators believe Maliki is responsible for: the fall of Mosul, the Speicher Massacre, and the squandering of Iraq’s money. Nouri and Moqtada al-Sadr are squaring off for upcoming elections -- whenever they might be held. Provincial elections were actually supposed to take place in April. They have been delayed until September but there's also a proposal to combine them with next year's national elections. THIS JUST IN! MSNBC HIRES ALL THE WAR MONGERS!